It was a long two weeks in which almost a third of my time was spent on overnight buses. I traveled from Buenos Aires to Bariloche to El Bolsón to El Calafate and back to Buenos Aires, all by bus. When I arrived in Argentina, I gave no consideration to leaving Buenos Aires. As one of the world´s largest cities, I figured I would have plenty to do. Then I read Bruce Chatwin´s, In Patagonia, a travel classic and absolutely epic account of man´s need to see the desolate Patagonian terrain. Then I stumbled upon Paul Theroux´s, The Old Patagonian Express, a journey through the region that started in Boston and ended in the desolate, Patagonian terrain. Theroux was a friend of Chatwin´s by no coincidence. So it was, I decided to make my way to the desolation that is Patagonia. I decided to take the bus although everyone recommended that I fly straight to Bariloche. However, I wanted to see the country and meet the locals, as locals don´t usual have the luxury to fly. 1) Retiro Station: They do not announce when buses are not coming. I was waiting for my 4 p.m. bus with the company Via TAC. It was my first time on an outer-city bus in Latin America. I was a little nervous, traveling alone and with my mediocre Spanish. However, I pushed through. I waited. And waited. The bus never came and I had to change my ticket for the following day with another company — Que BUS. 2) No soap in soap dispensers — bring some if that kind of thing really freaks you out. 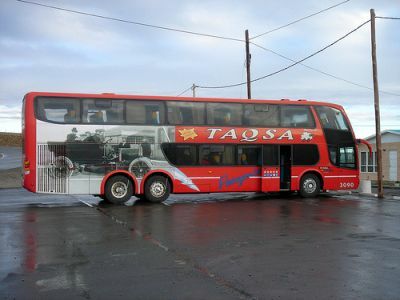 3) My rid on Taqsa — the bus company that has a monopoly on all routes from Bariloche to El Calafate (with various stops to load and unload people — not for food or bathroom breaks) — was easily one of the worst bus rides of my life. I mentioned this before, but I got this ticket thinking that it would be more comfortable than taking the touristy, yet grueling, Ruta 40. I am not so sure anymore. 4) Andesmar Buses are a riot! This bus company goes all over and my experience with them was sheer hilarity. The drivers were blasting ¨Girls Just Wanna Have Fun¨ whenever we made a stop (and yes, there were 100% percent more stops than Taqsa). What they lack in interior design they make up for in great service. 5) Pay the extra 50 pesos for Executive Buses — especially at the end of a long trip when all you want to do is relax and think of your bed. It equals to about $15 American dollars and I consider it an investment for a decent, if not good, night´s sleep. Getting executive-class was not a voluntary decision on my part. There were no more public buses to Buenos Aires from Puerto Madryn and I didn´t care to see any penguins. I don´t regret one centavo. Nevertheless, I missed the Olympic Hockey game for Gold between Canada and the United States. A no-no for a Canadian like myself. I may be a little disappointed, but Patagonia was well worth it.